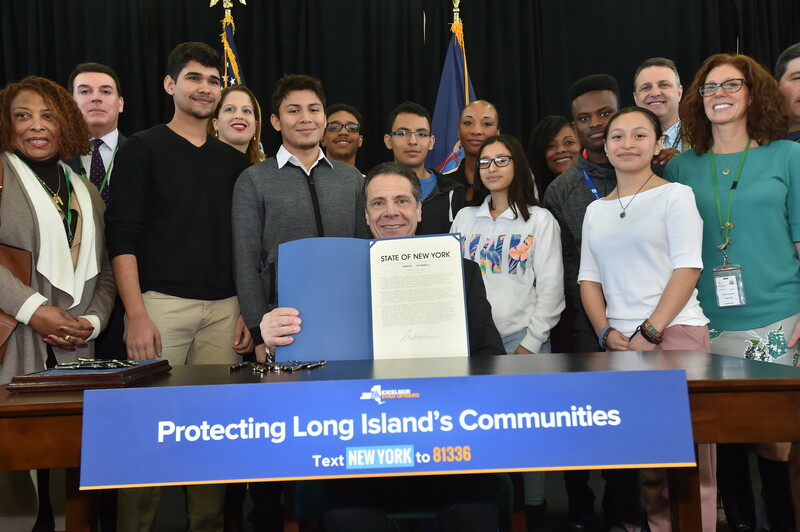 Governor Andrew M. Cuomo today announced $18.5 million included in the FY 2019 Enacted Budget to launch a multi-pronged program for at-risk young people that will help Long Island communities cut off the MS-13 gang recruitment pipeline. Of this funding, $16 million will support the expansion of after-school programs, case management services and job opportunities for vulnerable youth, as well as community and local law enforcement initiatives to prevent gang involvement. A total of $2.5 million in funding will also support the Gun Involved Violence Elimination initiative and SNUG street outreach on Long Island, which provide law enforcement agencies and community-based organizations with resources to help combat gun and gang violence using proven, evidence-based strategies. Together, this commitment builds on progress New York has made over the past year and ensures that young people have the tools and resources to avoid involvement in a gang. "New York will not tolerate the monstrous acts and fear that MS-13 has brought to our communities, and by focusing on educating and protecting our young residents, we are furthering our efforts to drive out these violent criminals," Governor Cuomo said. "The launch of this comprehensive plan invests in critical programming to help stomp out gang recruitment, engage young men and women during and after school, and help protect New Yorkers from being victimized, as we work to eliminate MS-13's presence in this state for good." MS-13 is an international criminal gang that emerged in the United States in the 1980s. They engage in a wide range of criminal activity and are uniquely violent, oftentimes engaging in brutal acts simply to increase the gang's notoriety. Despite violent crime being down dramatically on Long Island over the past several years, a recent uptick in violent crime, including a series of senseless homicides, has been traced directly back to the MS-13 gang. This funding is the latest component of a holistic approach laid out by Governor Cuomo to eradicate MS-13 on Long Island and protect New York's communities. The FY 2019 Budget includes $2 million to expand the Empire State After School Program this year to schools and nonprofit organizations located in at-risk areas on Long Island, which have been identified by the State Office of Children and Family Services, Division of Criminal Justice Services, and Division of State Police, as well as County Executives, and local law enforcement agencies. This expanded initiative will keep young people engaged in sports, music, art, and other educational programming during after school hours and help deter potential gang activity or involvement. The successful New York Youth Jobs program will dedicate up to $5 million to provide job and training opportunities to young people who are most at-risk of being potentially recruited into gangs. This program will guide youth toward employment and vocational training positions and provide tax incentives to companies that hire unemployed, out-of-school youth between the ages of 16 and 24. This engagement will help provide a pathway for young people who may be pressured into crime because of their financial disadvantage. Over the next three years, $2 million will be invested to support local education programs focused on early intervention and violence prevention that target middle and high school students. Working with school districts and community-based organizations, this initiative will provide students with counseling, group programming, and other social services to help them avoid gang recruitment, peer pressure, violence, and delinquent behavior. Law enforcement agencies working with schools and community-based organizations on gang prevention education to help both in-school and out-of-school youth will be able to share $500,000 of this investment. To provide immigrant youth with the resources they need to succeed, a $3 million investment included in the FY 2019 Budget will be provided over three years to support comprehensive case management. This service will be used to support vulnerable young people, particularly new immigrant children who are often the focus of MS-13 recruitment. This case management will include medical and mental health support, addiction treatment, trauma and family counseling, language training, and other community support services to promote positive social-emotional development and strong ties to the community. To identify and respond to gang activity in "hot spots," as well as support local requests for actionable intelligence and increased service, the FY 2019 Budget supports the deployment of a State Police Community Assistance Team to Long Island. The 11-person team will include six Troopers, three investigators, one senior investigator, and one supervisor designated to partner with local law enforcement and community-based agencies to support their efforts to curtail gang-related crime. New York will not tolerate the monstrous acts and fear that MS-13 has brought to our communities, and by focusing on educating and protecting our young residents, we are furthering our efforts to drive out these violent criminals. The FY 2019 Budget continues to support the DCJS Gun Involved Violence Elimination Initiative, which is a nationally-recognized approach to reduce violence using evidence-based strategies. This year, Nassau and Suffolk counties will receive a total GIVE award of $1.9 million to fund community outreach efforts, training, equipment, and personnel - such as prosecutors and crime analysts. This support will be shared among Long Island's police departments, district attorneys' offices, probation departments, and sheriffs' offices. The FY 2019 Budget also continues support for the DCJS SNUG programs on Long Island. These programs, located in Hempstead and Wyandanch, provide community-based organizations, in partnership with local law enforcement, resources to conduct street outreach and steer young people away from violence. This year, these two organizations will receive a total of $687,500 - an increase of $78,500 over the previous year. Investments included in the FY 2019 Budget mark the latest effort to eradicate gang violence on Long Island led by Governor Cuomo. Last April, the Governor directed the State Police to deploy resources on Long Island to help combat MS-13, including 25 Troopers to conduct high visibility patrols in Brentwood and Central Islip, as well as undercover operations specifically targeting and saturating neighborhoods known to have high levels of gang activity. The State Police also provided six new investigators to the FBI-led Long Island Gang Task Force which comprises more than 30 members of federal, state and local law enforcement partners, and helps agencies combine intelligence and other resources to conduct comprehensive investigations into gang activity. Most recently, Governor Cuomo announced the deployment of a new Gang Violence Prevention Unit, consisting of 10 State Troopers. The unit will work to identify early warning signs of gang activity and coordinates closely with the Suffolk County Police Department on an "Educate the Educators" program to help teachers and faculty recognize the early warning signs of gang involvement and recruitment and provide training to students on the dangers of street gangs. Today's announcement enacts the 4th Proposal of the Governor's State of the State which was announced last December in advance of the legislative session. Senator Phil Boyle said, "New York's investments in gang prevention strategies, education programming, and gun safety initiatives have set us apart from the rest, supporting an increase in community outreach and, a decrease in violent crimes on Long Island. Thanks to the unwavering commitment and collaboration of Governor Cuomo, my colleagues in the NY State Senate and local leaders throughout the region, this latest investment will take our efforts to new heights and engage more students than ever before. I commend our communities for sticking together as we work to put an end, once and for all, to MS-13." Assemblyman Phil Ramos said, "MS-13 has wreaked havoc in our communities for far too long. I am proud to have worked with my colleagues in the legislature and alongside Governor Cuomo to ensure necessary funding is delivered to Long Island to help stop these dangerous criminals in their tracks and protect our some of our most vulnerable New Yorkers. I look forward to young men and women engaging in more after-school activities and taking advantage of new job training opportunities, as we work to build a brighter future for all of our residents." Suffolk County Executive Steve Bellone said, "As crime in Suffolk County continues to decline and remains at historic lows, we are committed to eradicating MS-13 through a comprehensive approach by focusing not just on law enforcement but also stopping the recruitment pipeline. Thanks to Governor Cuomo's leadership, this state investment will provide the necessary resources to help fund this anti-gang approach and keep our communities safe." Nassau County Executive Laura Curran said, "I am proud of the joint efforts across Long Island to eliminate the fear of gang violence and return peace to our communities. Thanks to Governor Cuomo's continued leadership he has ensured the state's the FY 2019 Budget delivered the funding necessary to provide much needed education programs and gang prevention strategies that will help keep our kids safe. In addition, he again shows his support for the men and women of our police departments by making sure they are equipped with the tools needed to combat gang violence and hold perpetrators accountable. I look forward to working with state and local partners to launch these programs and help shape the lives of New York's young men and women." Suffolk County Legislator Monica R. Martinez said, "The state's holistic approach - educating and protecting our children while working together to put an end to MS-13, is the road map we need to ensure a brighter future for all our residents. Under the leadership of Governor Cuomo, crucial funding has been delivered to Long Island that will help drive out fear from our neighborhoods and equip community organizations and schools with the tools we need to wipe out this vicious gang for good. I applaud our state leaders for working together to ensure these investments are made, and for working side-by-side with our region to keep our students safe."